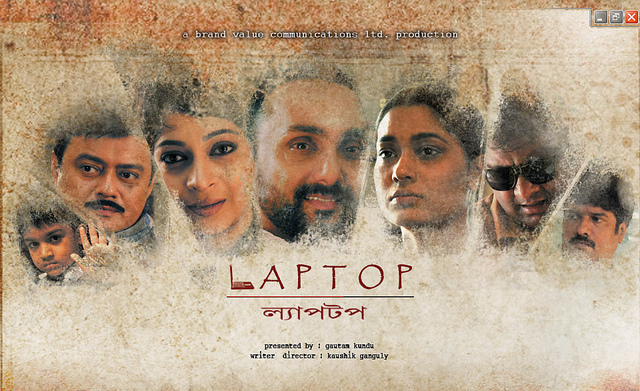 Laptop, written and directed by Kaushik Ganguly, is an odd film. It is not a remotely great film. It is a bad film. It is thematically untenable, ethically ambiguous and condescending, technically ill conceived, and art-wise artsy. Period. There are four stories in the film that have been transplanted from various echelons of the modern day Bengali society and the stories are made to cross over with each other with the intervention of a stolen laptop, a symbol of emotional connectedness among characters and vacuity thereof. Lets start with the narrative. A laptop, a trove of confidential medical information belonged to the owner of an infertility clinic, is stolen by a taxi driver to pay for his wife's treatment at the clinic. The driver concocts a story and sells the laptop to a hotel manager, a languishing father who works in a dingy, musty low-scale hotel so that he can afford his engineer son a laptop. The boy discovers on the hard drive of the laptop a number of pictures of a good looking girl who is the daughter of the infertility clinic's owner. The boy chases the girl's car, traces the physical address of the girl, and is finally appointed as the computer teacher for the girl. They instantly develop a liking for each other.But the girl discover's the stolen laptop at the boy's house and dumps him (and her own bike for apparently no rhyme and reason). The laptop then travels to a visually challenged author (and his typist), as a debt-clearing-device by the manager, who resides in the house owned by the author. Subsequently, the machine ends in the hands of a divorced publisher, who is in search of the kid born as a result of his sperm donation. As the laptop traverses, it touches lives only to change them in some inexplicable ways. I have hardly known a “good” film that works with a bad script. The problem is that this film loses focus when it centers on lesser-written tales, which Ganguly does not make better, and on some tales which he actually makes worse. The director has little regard for character development. So we never know why a particular character engages in an immoral act. For example, we are not shown what causes the driver to engage in an unethical activity. Is he intrinsically immoral, unethical? There is zero information. The character of the driver comes and goes with the blink of an eye. Consider the character of visually challenged author, the most righteous and saintly figure in the film. Despite knowing the background tales about the laptop, he suffers from no moral scruple when accepting the laptop from his renter. The manager’s character also displays the same nonchalant sentiment towards a laptop, which has been supposedly left behind by an amnesic passenger. The manager reveals to his family that the laptop was mistakenly left behind a forgetful passenger in the taxi. But being a typical middle-class family, they decide to ignore the episode and the film jumps forward. These characters come from various socio-economic classes and all of them exhibit the same apathetic behavior toward the stolen laptop; accept without any compunction. Ahem! So, in a nutshell, as if, the whole gamut human species have submitted to complete moral corruption. That is just to difficult to swallow even if one hails from the most corrupt nation from the earth. But, Ganguly marches on because the laptop is the driving force of the plot. There are also a few other minuses there. The film fails to devote enough screenspace to characters that occupy central roles and, erroneously focus attention to plot points or characters that disappear without no apparent rhyme and reason. For example, the character of the divorced publisher occupies the last 20-30 minutes of the film, but we have no clue to his psychological dilemmas, pains, and aspirations. As a result, we are never emotionally invested in the character. On the other hand, the director spends considerable amount of footage on the understated chemistry between the visually-challenged author and his typist, but the whole episode ends with no major dramatic culminations. The same frustration grips us with the story of the young boy and girl or the hotel manager. They end too abruptly. It seems that the director was trying to connect stories that are apparently disconnected and one story lends its way another by the way of a laptop. Ganguly fails miserably on this front as well as the transition from one to another is either too haste or too sporadic for a cohesive plot. In this connection, an exemplary film that pulls it of gracefully is Jafar Panahi’s The Circle. Another minus is the film’s lack of cohesiveness. Some scenes are juxtaposed with one another to evoke emotional responses, but their placement is too arbitrary in nature, which can be attributed to bad editing. The music is suitable for the mood of the film. The camera movements are slow, in keeping with the underlying sensibility of the film. But Ganguly must know that slow-moving camera and heart-wrenching music are not the only property of a good film. That way a film can be artsy, but no further it can progress. Actors have very little scope to perform. Bose is artifical or does not know what to do. 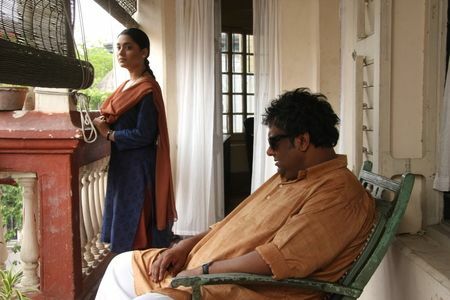 Ganguly’s character is too self-congratulatory, the actor playing the role of the wife of the tea estate couldn’t touch the nerve of her character. She is the weakest link in the film. The climax is utterly ridiculous. Overall, this is a Laptop that performs its best when untouched.